Since their launch, Path has maintained that they aim to be a very personal moment sharing service. The idea there is that it wouldn’t just be limited to photo sharing. And as of tonight, they’re not. 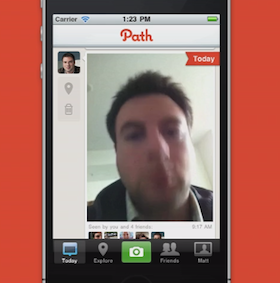 Path has just added video support to their iPhone app. And in what is sure to be another controversial idea, the clips are limited to only 10 seconds. The latest version of Path, 1.2, which should be live in the App Store shortly, allows users to upload these short video clips alongside the standard pictures. And just as with pictures, these video clips can be tagged with the people, places, and things in them. Path 1.2 brings some other new features as well. For example, users will now see people they’ve recently tagged in pictures and videos at the top of their own streams. The idea here is to show you content from people you’re actually hanging out with the most. The new Path also has a better iPhone notification system. This will take you directly to the posts mentioned rather than just the app itself. The 10 second time limit is an interesting choice. Certainly, from a mobile perspective, it makes some sense. Videos, even short ones, can take a while to upload when you’re not connected to WiFi. But this will remind some users of the old 12 Seconds service — one of the original “Twitter for video” services that didn’t end up too well. Again, look for the new version of the app shortly here. And see more in the video below.